First full poetry collection by the author of Above the Clearwater, finalist for the 2004 Oregon Book Award in creative nonfiction. 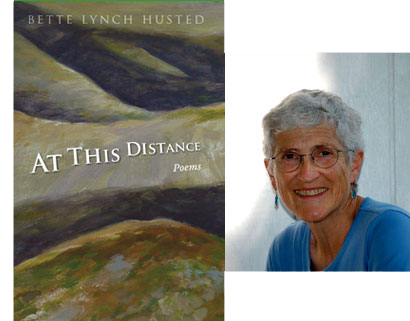 ​"Bette Lynch Husted, so richly rooted in the wild Oregon land she inhabits, writes with deep care and conscience. Her poems shun nothing--exploring difficult legacies and the mysterious encroachments of 'what people do' with calm humility and curiousity. She asks the questions. 'Anything a Box Will Hold' can't be missed. When she speaks of the 'winter wren singing his small whole-bodies celebration amid bright moss," that's her voice too, in the giant landscape--comforting and clear." "Space. Spaciousness. Amidst such vistas, these poems are placed. Visit. Stay." "This is a poet who will take you on roads you don't know to places where you haven't been, the lonesome places, Wallowa, Ahsahka, Imnaha, and on into the gray-crowned night. She travels the far West, the farthest West, farther than the pioneers. She goes the distance." "Bette Husted's poems in this collection explore the rural landscape, its peoples and why and how they live there...This is what important poetry is supposted to be, a caring look into a place one grew up and lives in." Bette Lynch Husted lives and writes in Pendleton. Her works include a chapbook, After Fire (Puddinghouse 2002) and a collection of memoir essays, Above the Clearwater: Living on Stolen Land (Oregon State University Press 2004, finalist for the 2005 Oregon Book Award and winner of 2005 WILLA Award in creative nonfiction). Her collection of essays, Lessons from the Borderlands, was published by Plain View Press. Her essays, stories and poems have appeared in Runes, Fourth Genre, Prairie Schooner, Natural Bridge and other journals. She was a Fishtrap Fellow and received a 2007 Oregon Arts Commission Individual Artist Award.